Following on from the success of the original Ward-D-Vision, we have introduced this long range unit which has the benefit of an upgraded sensor and increased battery life providing improved distance and higher resolution. The Ward-D-Vision 700 long range digital night vision add on system is designed to be coupled behind a normal day telescopic sight to give it night vision capabilities. 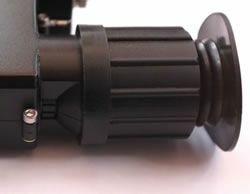 The system will work with most day telescopic sights, providing they have an adjustable objective, or preferably (for ease of use) a sidewheel focus system. Useable range (for shooting not just eye shine!) 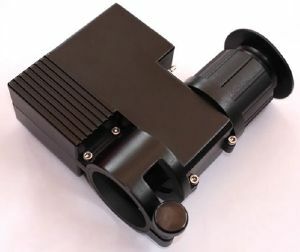 is up to 400m when used with our Ward T67 aspheric IR illuminator and 250m when used with the small T20 IR illuminator. Note: The system requires an IR illuminator to work in complete darkness. The Ward-D-Vision 700 unit is manufactured here in the UK at our premises so spares and accessories are always available. The product speaks for itself. Setup with a Sidewinder 4-16 scope and T20 IR it is simply amazing. An amazing piece of kit. The unit went straight onto the scope (Leupold VX III 4.5-14 x 50) . The definition of the picture is fantastic. It took just a few minutes to adjust the scope so as to get a clear picture of the reticle. My original scope mounts are too low, causing bolt to contact the unit (rifle is a Tikka T3, I was using extra low mounts), but am canting unit over until I get my new, higher mounts fitted. I'm one very happy customer. It's like I've got a night time subscription to the Discovery Channel on my day scope! With a good IR illuminator it gives you the same shooting range at night that you have in the day. Works a treat on my Swaro Z6i with the FOC bushing they sent.